Going underground with Introversion's timeless classic. Amongst all of the gutted throats, bombastic trailers, sublimely ridiculous conferences and everything else that we've come to expect from E3, the most exciting thing that happened to me this week was the quiet announcement that Introversion's Uplink had been released for the iPad. In much the same way that Ubisoft's Watch Dogs grabbed more attention than it otherwise would have by being an honest-to-goodness, actual surprise at the infamously leaky conference, it had a bigger impact. You've no idea how excited I was when I saw this map on my iPad. It's a daft reaction in many ways because I still have the game on my PC at home, and have played it to death in the ten years since it was first released. What made the announcement so exciting though is that Uplink truly represents what the mobile platform should do best: offer development freedom, accessibility and opportunity. While increasingly few titles dare to step out of the shadows of the more commercially successful mobile games, Uplink is the real independent deal. Not so much a hacking simulator as it is a simulation of classic hacking cinema culture (WarGames, Sneakers etc), Uplink is, mercifully, about as far removed from the world of 3-star level ratings, cartoon protagonists and physics puzzles as you could hope for on the App Store. 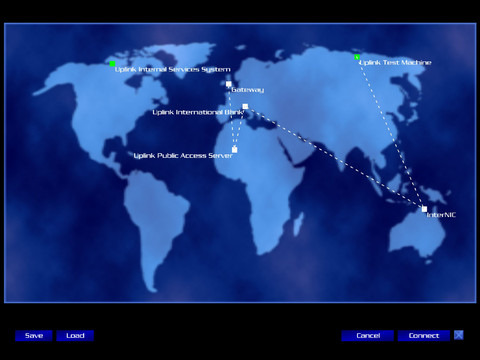 You'd have to go a long way to find a game like Uplink on the App Store. The world is nothing more than a cold but crisp computer interface, through which you hack into installations in order to steal files, frame unsuspecting victims, or forge documents for your friends. Uplink plays all of its hands with an entirely straight face, from the cold log-in screen that greets you when you first boot up the game, to the urgent dial-tones of your primitive modem. 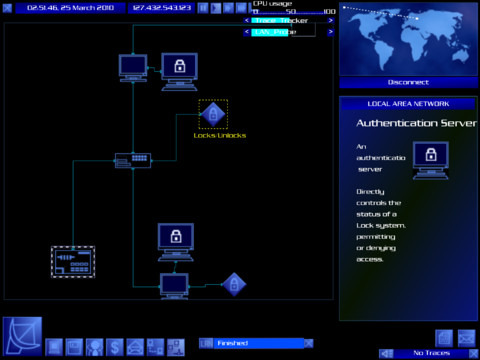 In order to complete missions and avoid detection, you need to trace your connection through multiple servers, deploy password cracking software, manage CPU resources, and continuously upgrade your tools of the trade, all under the pressure of your target's tracing software which homes in on you with increasing urgency. This is a fraught and tense adventure, and before every mission you'll find yourself mentally preparing and focusing before throwing yourself into the heist. It's pure escapism in a package you've never experienced before. Successfully completing missions increases your rating, which in turn opens up more and more interesting jobs, and if you're unhappy with the terms of your contract you can always open up negotiations with the client. While the conversation options may be basic, it's this combination of cold communication with the detached interface of Uplink that makes the gameplay feel real in a way that is patently ridiculous, and yet hopelessly absorbing. Developing your skills and equipment is incredibly satisfying. And then there's the music. The soundtrack is every nostalgia-inducing hacker movie score wrapped up into one glorious whole, and had it been played with anything less than the same straight face that drives the rest of the game, it wouldn't deliver the outstanding atmosphere that it does. Ominous basslines, synth drums, and fizzing high-octave synth-runs flow with perfect suspense as you dig deeper into the digital world. 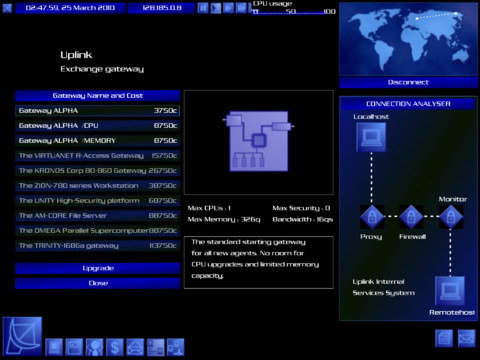 Uplink is a sublime game that hasn't aged a bit, paying the same tribute to the mainstream perception of Hollywood hacking culture that persists today through those same fondly remembered films. Please buy it. If you do, we might get DEFCON next. What's Hot: Truly unique gameplay, incredible music and one of gaming's greatest escapes. What's Not: Some of the windows are a little fiddly on the iPad's touchscreen, given the absence of a mouse cursor. Nothing you won't acclimatize to quickly though.